Signed and dated, lr: “W. T. Trego, ’81” with the three capital letters superimposed in a monogram. 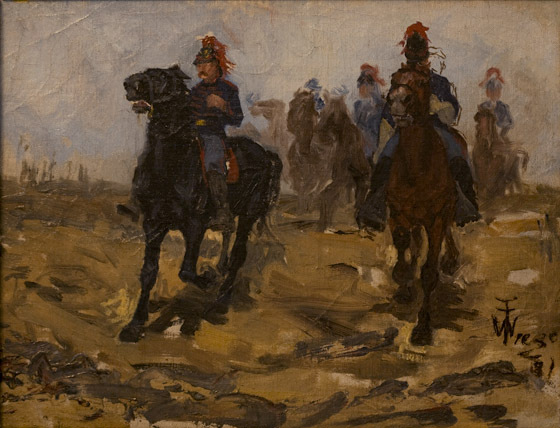 The soldiers in this oil study are clearly intended as French dragoons, but the horse and rider to the left served as the models for the figures in his first major Civil War work, Battery of Light Artillery en Route in 1882. Perhaps the artist fell back on an earlier study for just the right figures in the 1882 work. In any case, it is clear from this study that by 1881 Trego’s interest in military scenes already extended beyond his interest in the American Civil War. This study shows evidence of Trego "drawing with the brush," a technique urged upon his students by Thomas Eakins. It was a technique that Trego felt encouraged sloppiness and he resisted using it.